Mycroft Holmes. Watson. Baker Street. ISBN 9781907230615 price may vary. 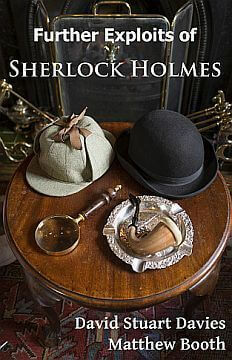 David Stuart Davies is the author of seven novels featuring Sherlock Holmes as well as several non-fiction books about the Baker Street detective including the movie volume Starring Sherlock Holmes. Other crime/mystery novels include A Taste for Blood. David is the general contributing editor for Wordsworth Editions Mystery & Supernatural series and a major contributor of introductions to the Collectors’ Library classic editions. Matthew Booth is the author of Sherlock Holmes and the Giant’s Hand and When Anthony Rathe Investigates. He is an author in the MX Publishing Undershaw Preservation project, having contributed to their anthologies of new Sherlock Holmes stories.